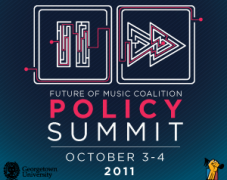 Shortly after news of Rhapsody’s acquisition of Napster broke, Rhapsody Chief Product Offer Brendan Benzing discussed trends, and the future of the mobile music space, at the Future of Music Coalition Policy Summit in Washington, D.C. on Monday afternoon. WASHINGTON, D.C.— The sky was falling on Cheap Trick when the band was playing the Ottawa Bluesfest in mid-July. WASHINGTON, D.C.— At the intersection where Capitol Hill policy, technological innovation and musical creativity meet, tensions spilled over at the two-day Future of Music Summit while government officials washed their hands of the mounting chaos. Count it as a mixed blessing, for what artists — inherent outsiders and rule-breakers, if they’re doing their job well — want politicians telling them how to do their business?